Bathrooms are very utilitarian, but that doesn’t mean they can’t be beautiful (and why not get ready for your day or unwind at the end of it in a spa-worthy room?) Here are the top 10 bathroom design faux-pas, and ways that you can escape these mistakes when creating your own “aaahhhhh” space. Don’t rely on a single light source above the bathroom mirror – this can create nasty shadows, and generally isn’t flattering (and your home should help you feel like “your best you”). Instead, use wall-mounted lighting on either side of the mirror to give an even light to your face, which is also great for makeup application. Another good option is to use frame lighting all around the mirror, which provides a Hollywood star-worthy dressing room feel, and plenty of nice light. A great bathroom is a well-functioning bathroom, so enlist the help of a bathroom planner or designer to help you maximize your space, avoid expensive mistakes, and make sure you’re compliant with building regulations. 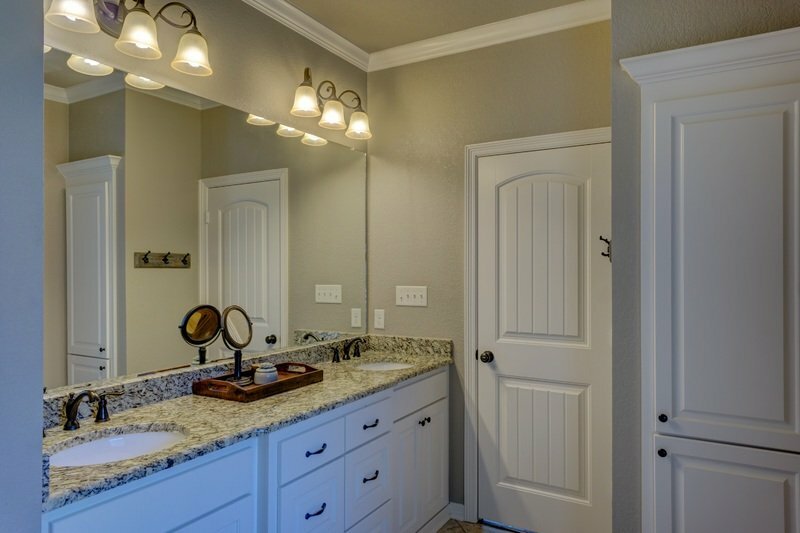 It’s easy to forget that bathrooms require plenty of space to hide away lotions and potions, store towels and linen, and house makeup cases. Get creative with your storage space, and consider options such as recessed alcoves and pull-out shelves. Maximizing the space below the sink basin is another simple way to add more storage space to your bathroom. Large-scale tiles not only make your life easier, with less grout to clean, but will also make your bathroom seem bigger. If you tend to find yourself standing in line for the bathroom in the mornings, try separating bathroom elements. Consider placing a sink basin in a shared space where people can come in and out, and separating the toilet area or bathing space with frosted partition walls. 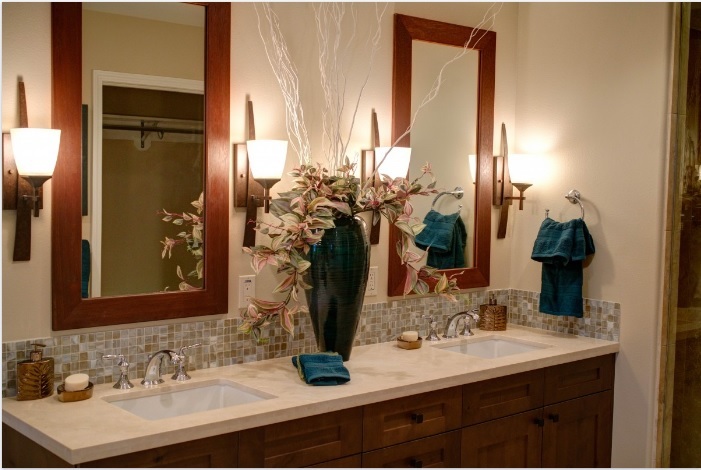 By separating elements of your bathroom, more people can enjoy the space at once, and you can reduce your wait time. Renovating a bathroom is a big investment, and one that can attract or put off potential homebuyers. If you’re considering selling (now or in the future), it’s best to keep its design minimal. Stick to neutral colors, and good-quality white goods with classical lines. 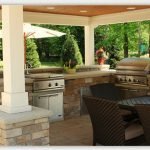 If you love wacky patterns or bright colors, these can be added to the design with removeable items, such as towels and bathroom accessories. Choose efficient, water-saving appliances (toilet, bath, shower, and sink). Not only will you feel content that you are doing your part to help the environment, but you’ll also enjoy long-term savings on your water bill (and can use your eco-friendliness as a selling point if you decide to move). Bathrooms are hot and humid environments, so it’s essential to choose materials, paints, and surfaces that can hold up against these conditions. For example, consider using water-friendly shutters instead of fabric curtains. When planning your house, be wary about placing a toilet area or bathroom too close to a kitchen or living room, or in an area that can be seen by a neighboring house. A big priority for bathrooms is that they feel private. There are a number of ways to create this vibe, including placing windows at a high level, or accessing bathrooms through intermediary spaces, such as walk-through closets.